Get the most from SEA SOIL with these great growing tips. For the past five years, SEA SOIL™ has been tested and utilized in planters and pots, spread in various depths from several feet to several inches on lawns, with trees and shrubs, and probably every annual and perennial available to ensure good results in all possible scenarios. It can be used "as is" or mixed as desired. It is a great addition to a back-yard compost or your favorite soil recipe as it adds nutrients, organic matter and will assist in retaining moisture. SEA SOIL is a wonderful product for building your present garden soil into a healthy, productive growth medium. Can I use SEA SOIL to grow and or patch my grass? Yes. Rake SEA SOIL over the area that will be seeded about one and half inches thick and seed as specified on grass seed bag. If seeding a big area consult your local landscape company or garden centre about blending in washed sand to help with drainage. Your grass will be naturally fertilized to give it a great start. If you use it in pots make sure that a water collection device (saucer) underneath because the runoff is murky and you will need to clean off your deck or walk. Is It Good For Pots Or Containers? 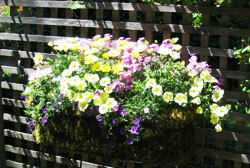 Yes, if you have existing soil in your pots or containers do not throw it away. Blend SEA SOIL™ into it and amend the soil you have. Your money goes further by blending and amending not replacing. If you are starting a new pot, SEA SOIL™ can be mixed or used alone. Blend SEA SOIL™ into the roots of your plants and top dress an inch to two inches after planting to fertilize for the whole season. Use it as mulch that also fertilizes. Just make sure the mulch layer is about two inches deep to suppress the weeds below. Is SEA SOIL good for all plants? Not all plants. 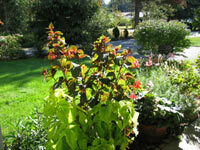 Some plants such as drought resistant plants need very well drained soil that does not retain moisture. Ask people if they have a special needs plant. SEA SOIL can be added to your custom soil blends in most cases to provide the organic fertilizer. Have a Tip You Want To Share with Our Readers? If you have a great tip for using SEA SOIL, send it to us today and you could see your tip on this page.